California Congressman Darrell Issa (need I say he's a Republican?) 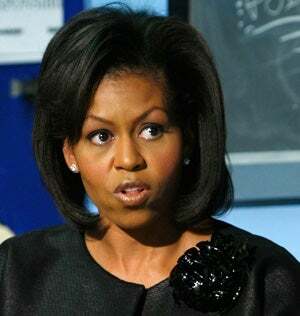 has introduced a bill to restore honor to the White House by prohibiting Michelle Obama from doing any substantive work. Issa's bill is required because, according to a 1993 federal appeals court ruling when a bunch of conservatives sued the Clinton Administration over Hillary Clinton's health care task force. Republicans had sued claiming that Hillary's participation in the White House Health Care Task Force — since she wasn't a federal employee — made the group an outside advisory panel to which federal laws requiring that its meetings be public and announced ages in advance applied. The appeals court ruled that the First Lady was functionally a government employee, meaning that she could participate in policy discussions and debates like any other member of the Administration without complying with the onerous requirements on outside advisory groups designed to limit the ability of lobbyists and special interests to influence policy. And if you're wondering why this hasn't come up in more than 15 years, well, Issa technically did introduce the bill early last year (though he didn't push for its passage the way he is now). It probably wasn't aimed at Michelle at the time — and it strains credibility that Issa thought it was important to limit Laura Bush's role in policy debates. When Issa introduced his bill he was, of course, trying to go after Bill Clinton and Bill Clinton's ability to shape policy debates. "We are trying actually to protect the historic role of the first lady," Issa insisted, repeatedly invoking the "transparency" mantra of the Obama administration. "I believe this is open government at its finest." You know, the "historic" role of the First Lady in which she behaves like a proper lady, doesn't contribute to policy debates and hosts the White House East Egg roll. God forbid we have another Edith Wilson, Eleanor Roosevelt or Hillary Clinton in the White House when we could have a "traditional" First Lady.